Imagine applying a beautiful shade of blush, eyeshadow or lip color in the middle of a hot, humid scorching summer morning and having FULL confidence that not only will you be able to get out of the door within minutes - but your makeup will look great all day long. This is very much a reality now with MAKE UP FOR EVER Aqua Cream , the latest product in the Make Up For Ever Aqua line of products, which founder and makeup artist Dany Sanz put to the ultimate long lasting and performance test - that of the lovely French Aqua Ballet teams! The line of creams can be used for eyes, cheeks and/or lips, with about more than half specifically for eyes/cheeks. The cream was weightless, silky smooth and quite buildable, so I was really able to create any time of look I wanted to with them. (hot pink with gold flecks) on my cheeks. After the event I played with these shades on various days, in addition to a few more, like the Coral, which was beautiful on my cheeks and lips. It really was truly waterproof and sweat resistant, non creasing, and stayed true to it's color all day. (Remember, the little Aqua Ballerinas in France use it for their performances - and they're in the water for hours)! Because all of the colors start on the sheerer side and are extremely blendable, almost all of these shades will work on all skin tones - no matter how fair or dark you are, which I think is remarkable. The darker shades can also be used as long-wearing eyeliners, which is wonderful. Note: Some of the shades that can be used on the lips are on the drier side, so I recommend a light layer of lip balm before applying. 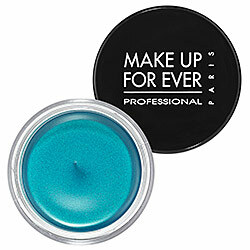 *These products were provided courtesy of Make Up Forever for reviewing purposes.